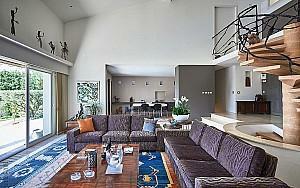 Contemporary Californian-style villa of 300 m² on three floors, two levels directly overlooking the garden. 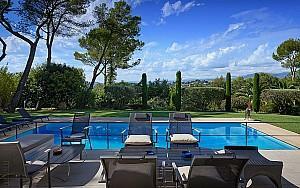 Clear view of each room on the village of Mougins and the hills. 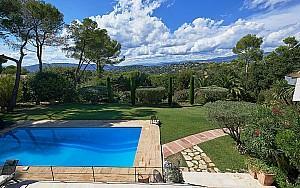 Garden beautifully wooded, pool terrace at the foot of the main facade, surrounded by lawns. 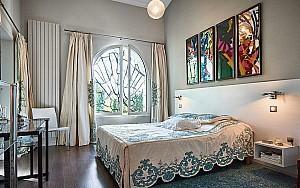 - A living / dining-room of about 70m2 opening by large windows overlooking the terrace. 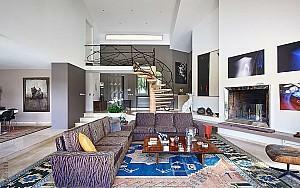 - Adjoining, a kitchen of 30m2, opening on the same terrace. - Terrace 4m x 15m marble on the entire facade. 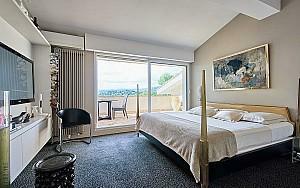 - Large air-conditioned room with half floor with bed of 1.60m x 2m. Many closets. 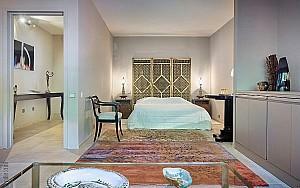 - Master bedroom with private 3mx6m terrace. Double bed 2m x 2m. 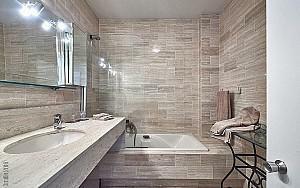 - Bathroom with double sinks, Jacuzzi bath and separate shower. - 2 bedrooms, bay windows overlooking the garden. Beds 2m x 1.60m. Many closets. 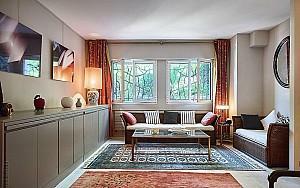 - 1 studio north facing 50m2 with separate entrance, with a lounge area in the large bedroom. Bed 2m x 1.60m. Bathroom with shower / wc. Internal alarm (volumetric and peripheral sub-shutters) and external connected to a SAAS security firm illuminating the garden when triggered. Intercom and videophone. smoke detectors. Carport for 2 cars + ample parking. Electric entrance gate with videophone. Heated swimming pool 13m / 5m - Alarm security-bath. Regular check by SAAS agents and municipal police, several times day / night.